Malin Akerman strikes a pose on the black carpet as she arrives at the Art of Elysium event on Saturday night (January 5) in Los Angeles. The 40-year-old actress showed off some leg in an emerald-green dress as she was joined at the event by Kris Jenner. Inside the event, Visual Artist Beau Dunn was honored with the Spirit of Elysium award. Other stars at the event included Arielle Kebbel, Amy Smart and husband Carter Oosterhouse, Bonnie Somerville, Emmanuelle Chriqui, Christa B. Allen, Jamie Chung, Kristin Cavallari, and Michelle Trachtenberg. FYI: Malin is wearing a Christian Siriano dress. Kris is wearing Dundas. Beau is wearing a Berta gown. Christa is wearing a Giorgio Armani dress and APM Monaco jewelry. Kristin is wearing an ASHI Studio dress. Jamie is wearing a Cinq à Sept dress. 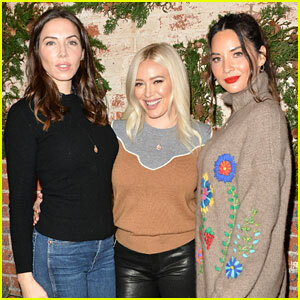 Hilary Duff and Olivia Munn strike a pose at the 1st Annual Cocktails For A Cause With Love Leo Rescue event! The 31-year-old Younger actress and the 38-year-old The Predator star stepped out for the event held at Rolling Greens on Thursday (December 6) in Los Angeles. Hilary hosted along with Whitney Cummings. They were also joined by Michelle Trachtenberg and Hilary‘s boyfriend Matthew Koma. ICYMI, see how Matthew recently clapped back at an Instagram troll who left a negative comment about him on a selfie Hilary posted. FYI: Hilary is wearing a Veronica Beard sweater and Rag & Bone pants. Olivia is wearing a Mandkhai jumper and Eriness earrings. Michelle is carrying an AEVHA London bag. It’s Hallo-weekend and lots of stars have been out and about showing off some amazing looks! Olivia Munn is just one of the celebs who was seen out at Casamigos’ Halloween Party on Friday (October 26) in Beverly Hills, Calif. Olivia dressed as Awkwafina‘s Peik Lin Goh from Crazy Rich Asians! Zoe Kravitz looked amazing in a vampire-inspired look, while Paris Hilton looked like she dressed as a lovely, colorful bird! Also pictured at the party were Molly Sims and Scott Stuber, Nicky Hilton (who dressed as her sister Paris from 2002), Karolina Kurkova, Jane Seymour, Will Forte, Michelle Trachtenberg, Charlotte McKinney, and more. Christian Siriano poses with a group of amazing women while celebrating the launch of his new book “Dresses to Dream About” on Thursday (November 30) at Chateau Marmont in West Hollywood, Calif.
Sarah Hyland, Isabelle Fuhrman, Selma Blair, Connie Britton, Kate Mara, and Niecy Nash are just some of the stars that stepped out. Others included Kristin Chenoweth, Samira Wiley, Angela Bassett, Willow Shields, Helen Hunt, Michelle Trachtenberg, Kathy Bates, Sarah Rafferty, and Alicia Silverstone. Christian was also joined at the event by his husband Brad Walsh. In the book, Christian shows fans his unique design process behind each look. AnnaLynne McCord Goes Gothic for Halloween with Michelle Trachtenberg at Just Jared's Party! Michelle Trachtenberg looks so cool with her intricate face paint at the 2017 Just Jared Halloween Party on Friday (October 27) in Beverly Hills, Calif. The 32-year-old actress was dressed up as Persephone, Queen of the Underworld. She hung out with Zelda Williams, who was dressed as Beetlejuice. Also in attendance at the event was AnnaLynne McCord, who sported a gothic look. She was one of the first guests to arrive and left with a cotton candy stick and a FIJI Water bottle in hand! The event had a clown theme for our sixth annual Halloween celebration and the private estate was decked out in red lights, balloons, and clown related products. FYI: Michelle is carrying a Vince Camuto clutch.